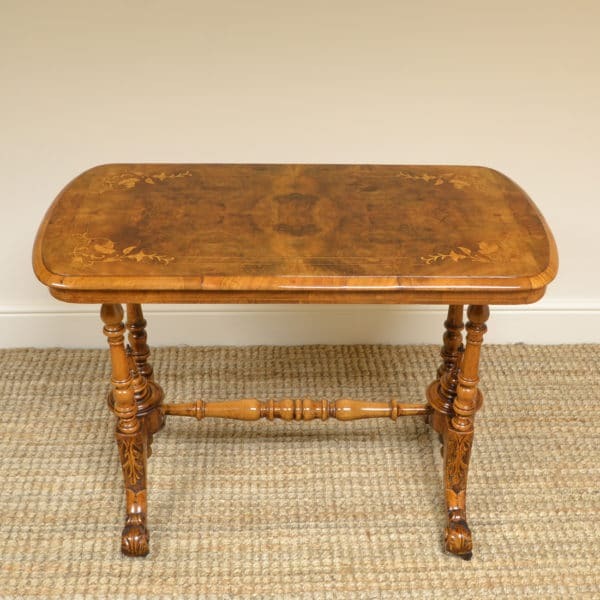 During the Victorian period of 1837 to 1901, the antique Victorian Tables were an essential piece of furniture in all homes. As the middle class started to become more wealthy, more homes were built to fulfil the fast growing housing market. 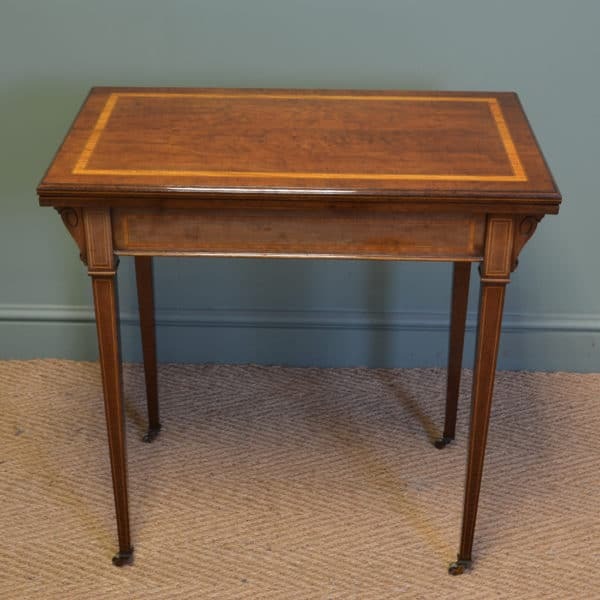 Every home needed lots of different types of antique tables for dining, writing to games playing as this was the height of fashion during this period. Fabulous new features were introduced on Victorian tables from turned legs with brass castors enabling them to be easily moved around, to extending dining tables with a crank handle to make them larger in size with unique mechanisms. Decorative timbers were used from Mahogany to Oak and usually with inlay or carved decoration around the edges and large sets of chairs were made to fit around them. As there was such good skilled, cabinet makers during the Victorian period and superb woods imported from throughout the world, these tables were made to last. This is why there is such a good selection still available today, ready for everyday use. 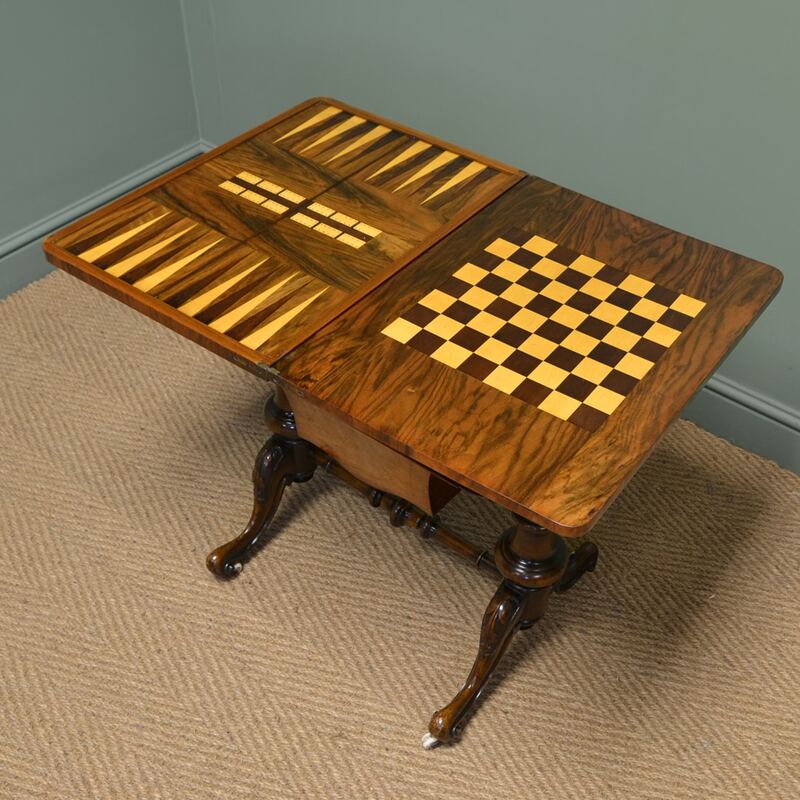 Here at Antiques world, We carefully restore them to a high standard using traditional methods, so they are in beautiful original condition, ready to be placed into your home. Have a look below at our lovely examples available for sale. Below are a few examples of previously sold Victorian Tables but if any particular style looks of interest please let us know as we do get many similar designs in stock and we can try to locate something similar. 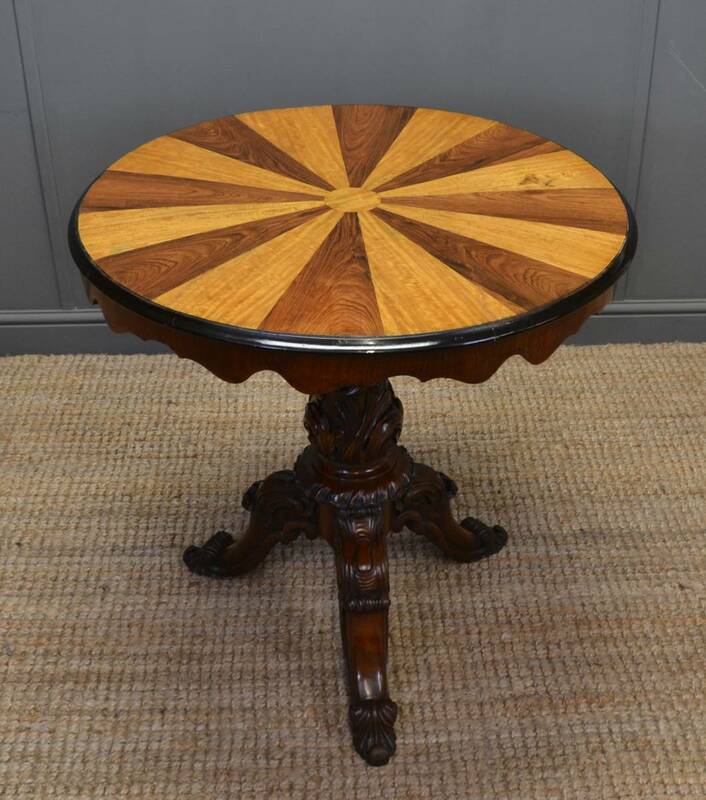 Stunning Antique Victorian Segmented Rose and Satinwood Top Occasional Table. This beautiful antique table dating from the Victorian period, circa 1870, is definitely a show stopper! It has a beautiful sunburst inlaid segmented top created through the clever use of contrasting rosewood and satinwood veneers and sits above an unusually shaped apron. The impressive walnut pedestal is ornately carved with acanthus leaves and has three beautifully scrolled carved legs emerging from its base. This table has a definite WOW factor created from both its design and use of woods. It also has the charm and character found from age and use adding to its authenticity as a piece of antiquity. 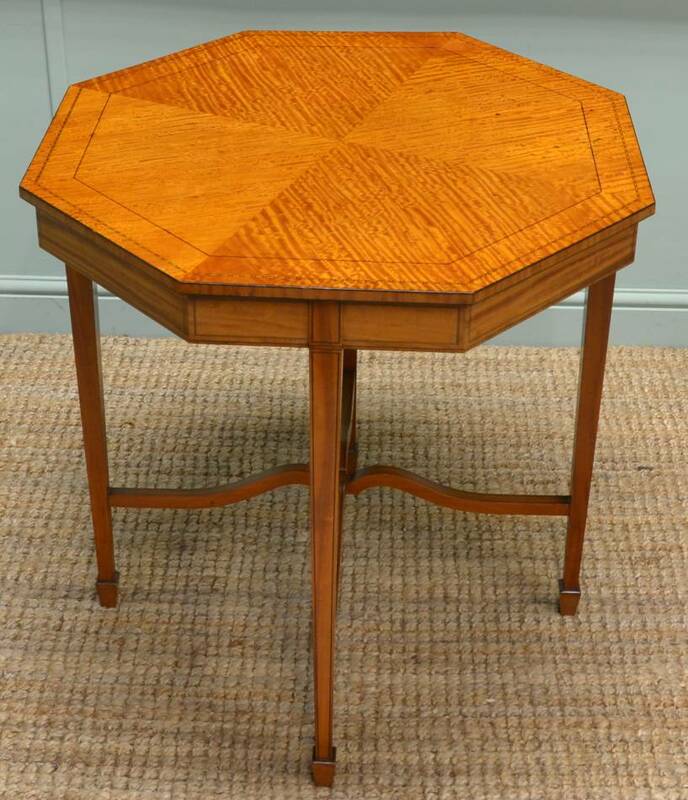 Superb Quality Satinwood Antique Victorian Table. 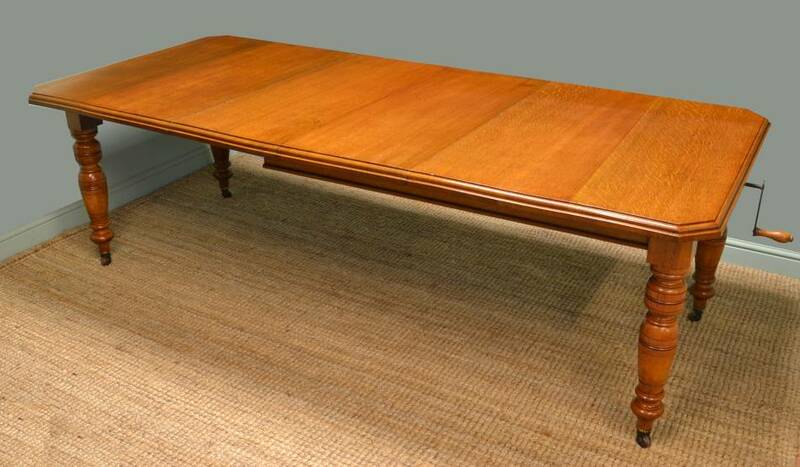 This superb quality antique occasional table dates from around 1890 in the Victorian period. It is constructed from the finest figured satinwood with an octagonal quarter veneered top which displays ebony string inlay along with boxwood and ebony decorative banding. Below the top hangs an apron that also displays beautiful string inlay. The table stands on four tapering legs with spade feet which are linked together with an unusually shaped decorative cross stretcher. 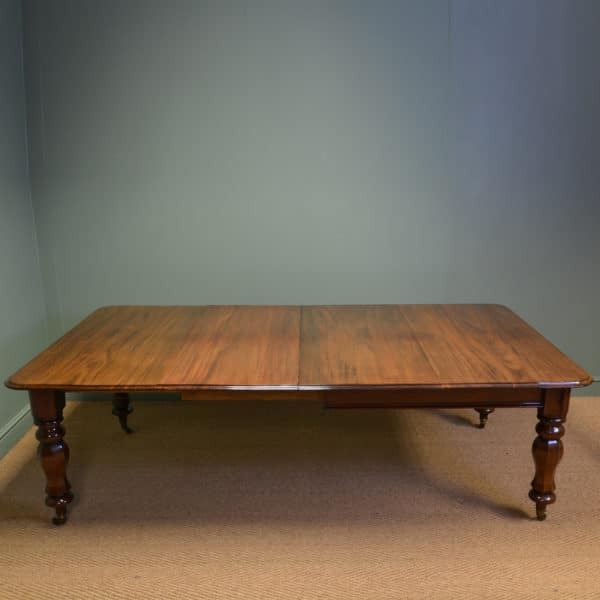 Victorian Mahogany Extending Antique Table. 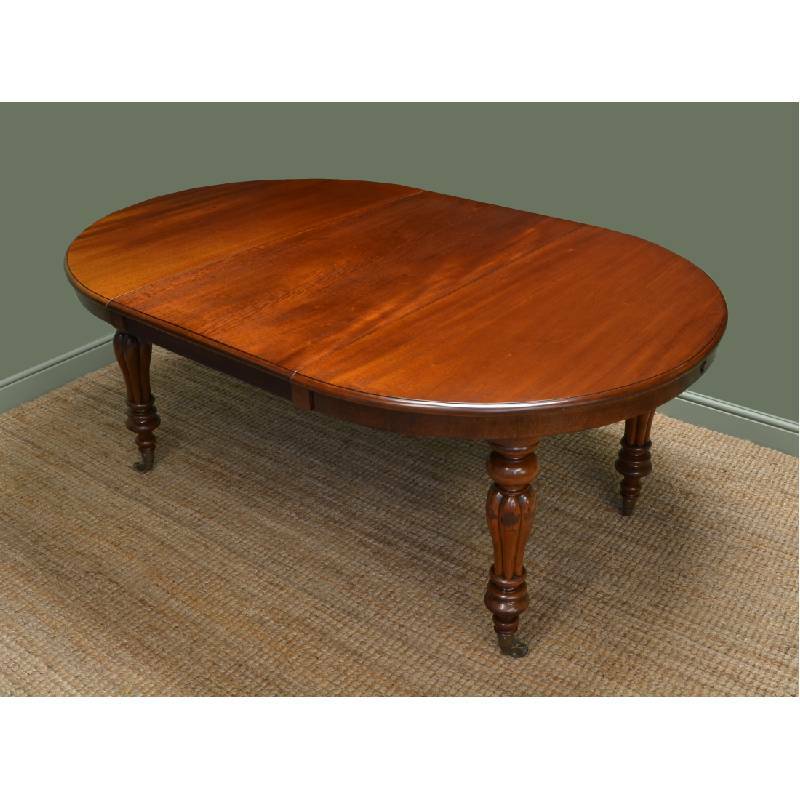 This draw leaf extending antique dining table is constructed from mahogany and dates from around 1870 in the Victorian period. 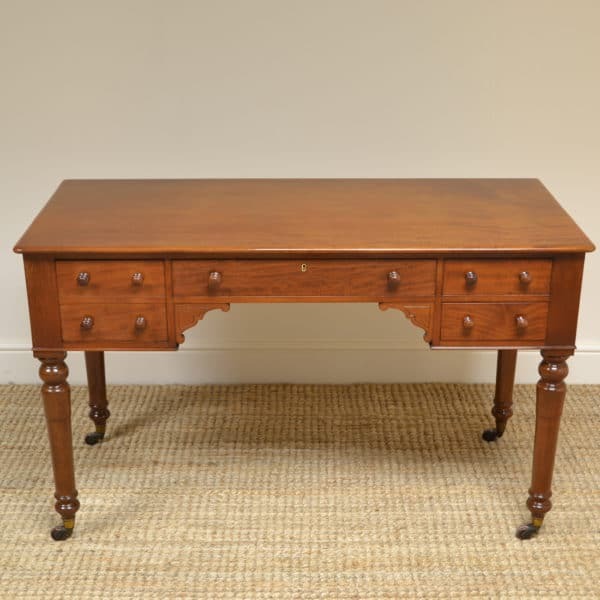 The solid mahogany top is beautifully figured with rounded corners and has a central removable associated leaf. It stands on four elegantly turned legs which have brass cup castors and white porcelain wheels. 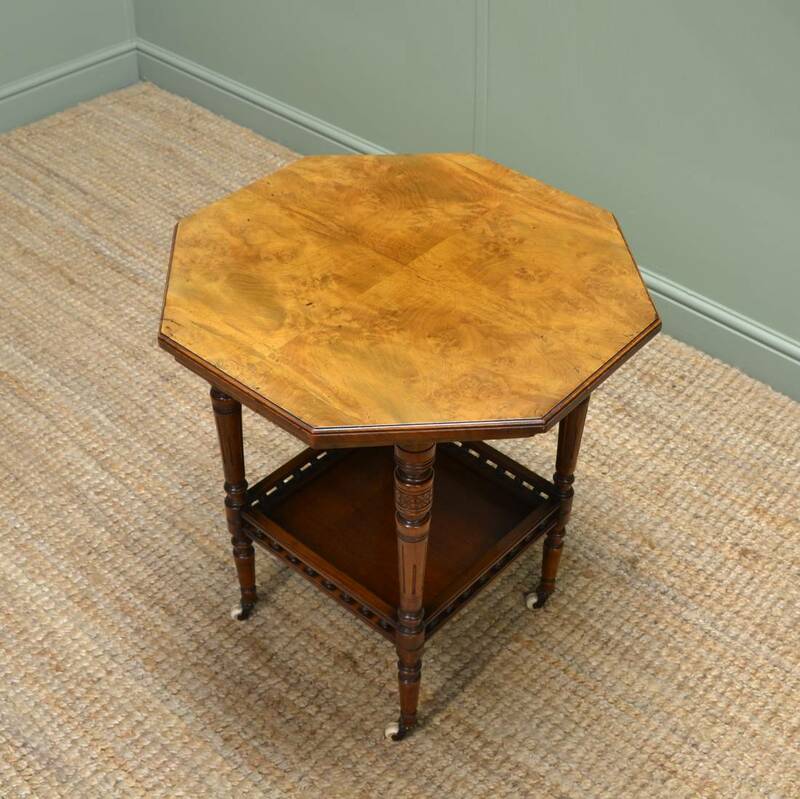 Quality Victorian Arts & Crafts Burr Walnut & Ebonised Occasional Table. 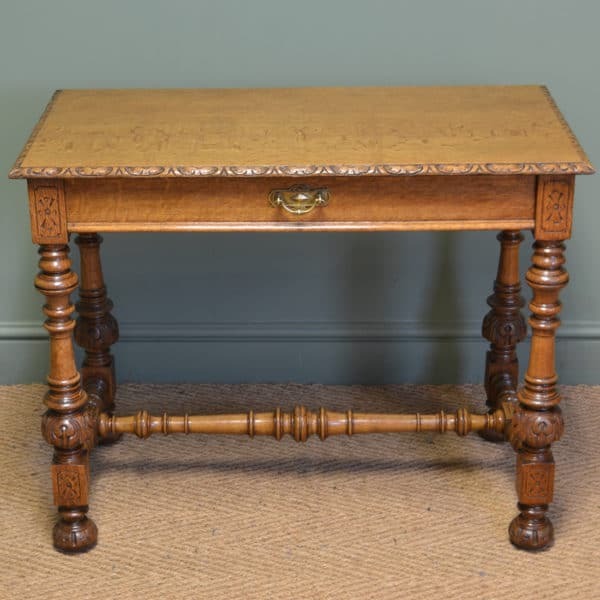 This fine quality, Arts & Crafts occasional table dates from around 1890 in the Victorian period and is made from burr walnut with ebonised detailing. It is stamped by the makers B. Taylor & Sons of New Bond street London. It has a beautifully figured burr walnut top with decorative inlaid feature highlighted by ebonised banding. 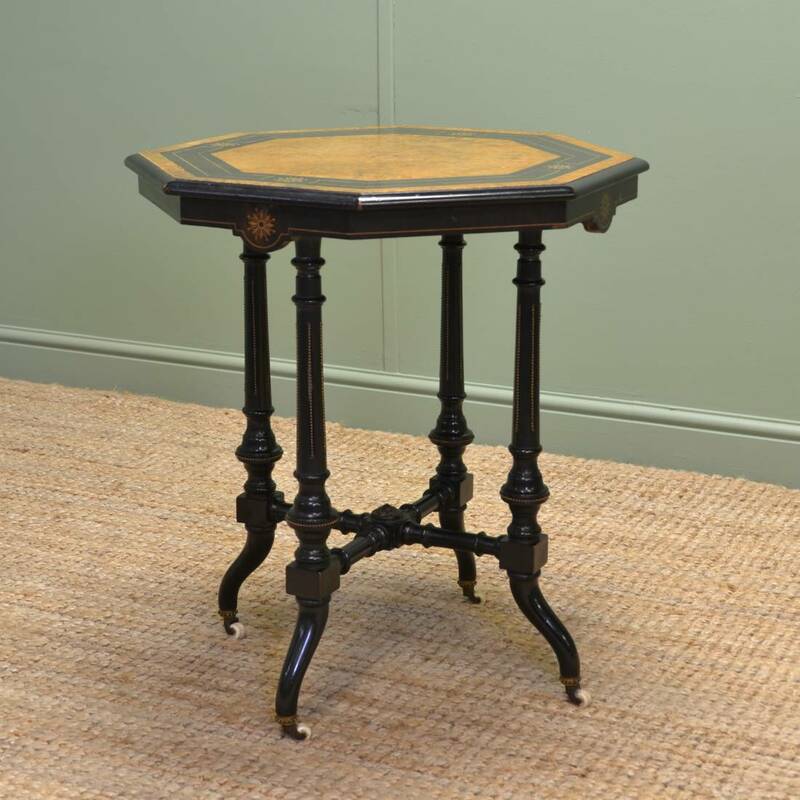 The octagonal top has a moulded edge and shaped inlaid apron sitting on a beautifully decorated base which has been ebonised and displays fine contrasting brass beading. The supports are finely turned and have a central brass motif, leading down to four splayed legs finished with white porcelain castors. Large Golden Oak Victorian Antique Table. 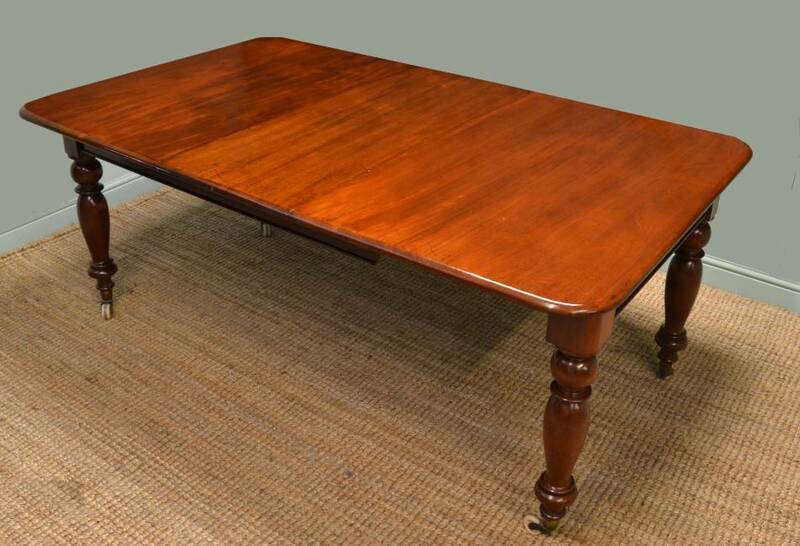 This wonderful golden oak antique dining table is a super example from the Victorian period, circa 1880. It has a solid oak moulded top with canted corners and two central removable leaves. It comes complete with the winding mechanism and winding handle. The table stands on four beautifully turned legs finished with brown porcelain castors. This wonderful large extending table is the ideal solution to the varying dining demands of the modern family with a seating capacity of up to ten to twelve people. Large Victorian Oak Antique Table by Roodhouse & Sons, Leeds. 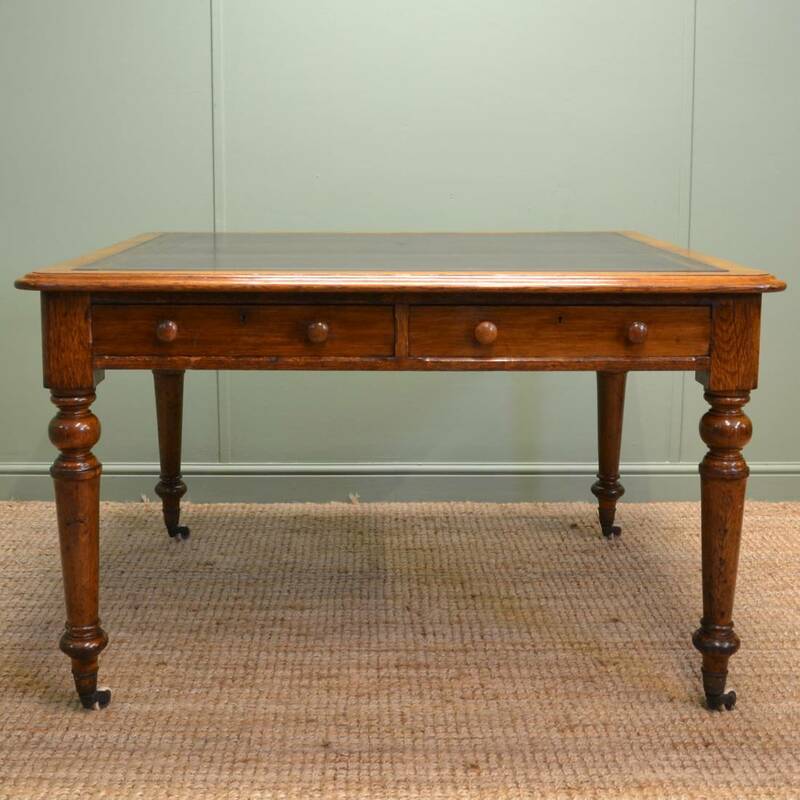 Dated 1869 this beautiful antique oak writing table has relatively large proportions and still retains the cabinet makers label of Roodhouse & Sons of Leeds which is also signed by the workman himself, a Mr Thompson. The rectangular moulded top has rounded corners with an aged tooled leather writing insert. Two drawers can be found beneath the work surface, these having turned handles. It stands on four turned legs which are finished with brass cup castors and white porcelain wheels. 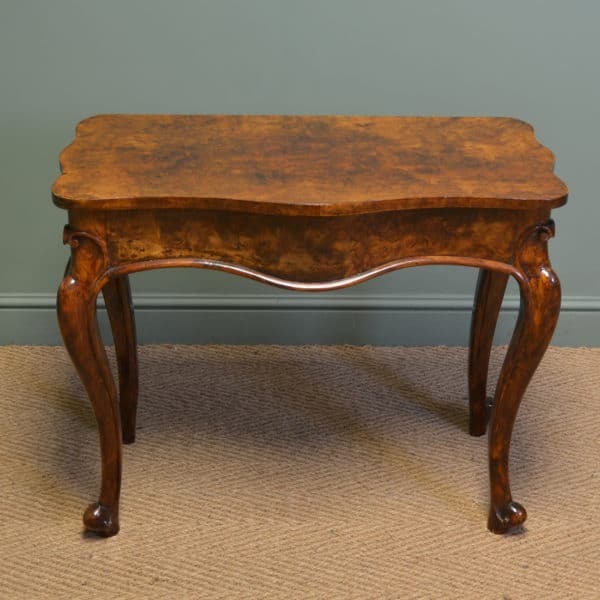 Superb Quality Figured Walnut Small Antique Victorian Table. Heavily influenced by the Arts and Crafts movement this small Victorian walnut occasional table is of superb quality and dates from around 1890. 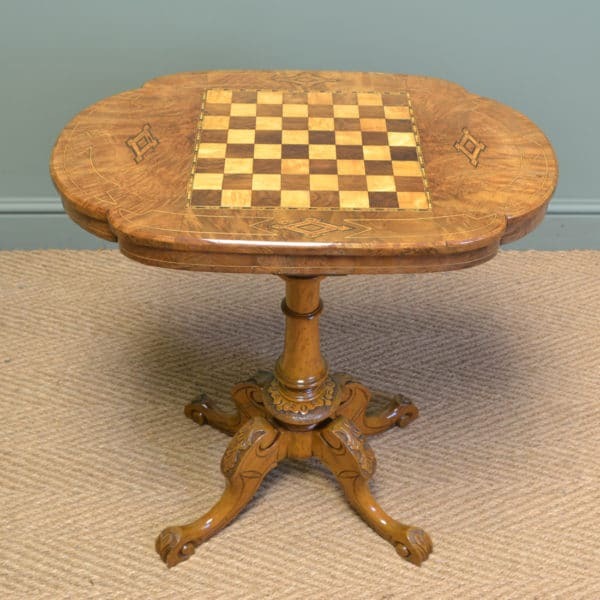 It has a beautifully figured quarter veneered octagonal moulded top over fine hand carved turned legs. It also benefits from a lower shelf with elegant turned gallery and is finished with white porcelain castors. 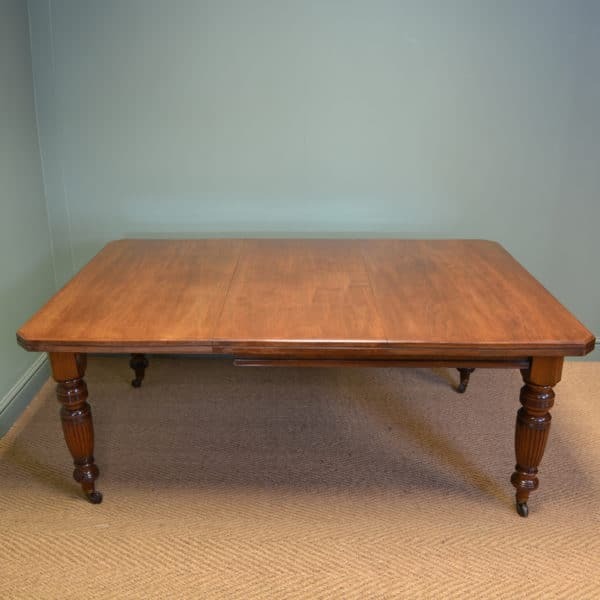 Quality Mahogany Antique Victorian Dining Table with Detachable Legs! 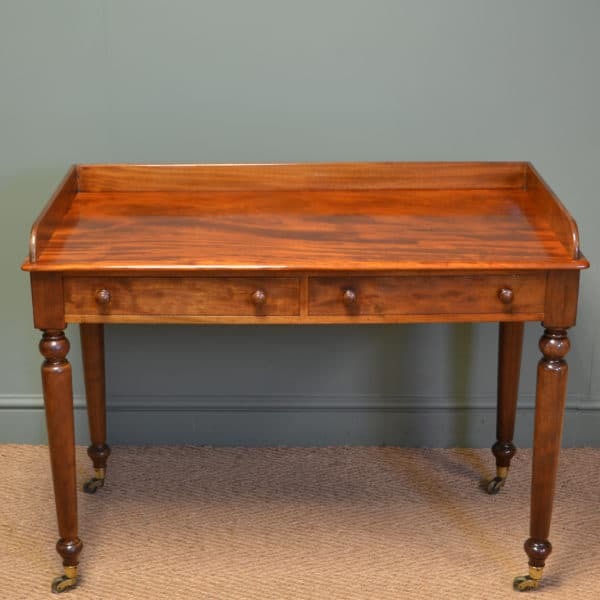 This rather unusual antique dining table dates from around 1870 in the Victorian period, is made from mahogany and comes complete with detachable legs! It has a winding mechanism along with winding handle and a single large central removable leaf. The top is solid mahogany with a moulded edge and stands on four beautifully turned legs finished with brass cup castors. It is the ideal table for those homes with small access points as the detachable legs make the otherwise un-achievable, achievable!